Wal-Mart(WMT) shares are down almost 2% today, despite a better-than-expected q4 earnings report. They reported 1.17 per share, versus expectations of 1.12. Revenue was a little lighter than expected. The company cited US comparable store sales (sales in stores open at least a year) as a reason for the light revenue. Investors are also not thrilled with first quarter 2010 guidance for earnings that is a bit below expectations, while 2010 full year guidance was in line. Gross margin of 24.9% came in better than the 24.2% people had expected, but a bit above last year's 24.3%. International sales of $100billion chipped in 25% of the company's total. Operating margins accelerated throughout 2009, with international showing the biggest improvement in the fourth quarter. Q4 international stores' operating margins of 6.4% still trail domestic's 7.9% margins, however, due to older US stores' higher profitability. Below is a look at how Wal-Mart deals with multiple compression. The company's cash flow stream is the envy of (much) of the investing world, yet the street values it cheaper every year. So Wal-Mart does what it can. They buy back stock hand over fist, they've increased dividends (though not to the level I'd love to see), while still maintaining big capital expenditures - critical to keep the existing store base fresh and their ability to expand. 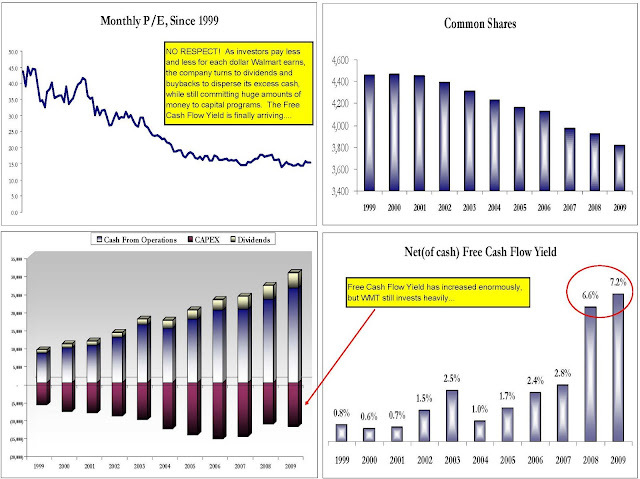 Note also that after years of razor-thin Free Cash Flow Yield, one can't deny that they're getting more attractive in that category. 2010 earnings could push FCFY% to the 8.5% range....an extremely juicy yield for a company with cost of capital several percent lower than that.